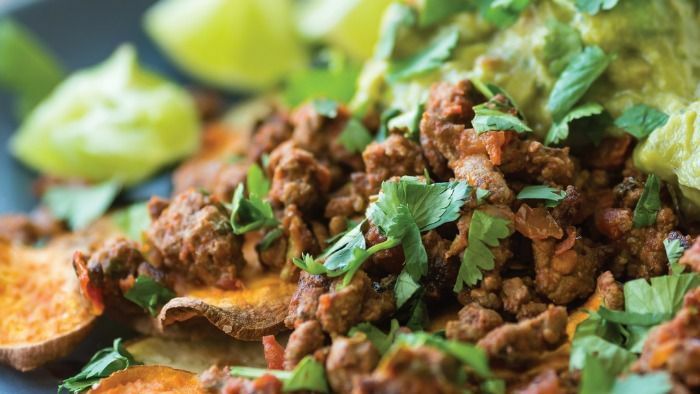 The fitness guru shares her ~healthy~ version of nachos on her app, just in time for Cinco de Mayo. Jillian Michaels is about to change everything you think you know about nachos. Let's start with the chips. This recipe swaps tortilla chips for homemade, just-as-crunchy sweet potato chips. The flavorful recipe also features all sorts of spices like chili powder and cumin, then tops the dish off with meat, pico de gallo, and guac. (Salivating yet?!) But don't be intimidated by what seems to be a never-ending ingredients list; every single one is a solid addition to a healthy diet. Peel the sweet potatoes and slice thinly. In a bowl, toss them with coconut oil and salt. Place the chips in a single layer on a rimmed baking sheet covered with parchment paper. Bake for 8 minutes, then flip the chips over and bake for another 8 minutes or until all of the chips are cooked. Melt the coconut oil in a large skillet over medium heat. Add the onion and chili and sauté for 3 to 4 minutes. Add the ground beef and cook for 4 minutes, stirring often. Add the garlic, canned diced tomatoes, tomato paste, cumin, oregano, paprika, cayenne pepper, and chili powder. Stir well to combine. Bring the mixture to a simmer and then turn the heat down to medium-low. Cover and let simmer for 20 minutes, stirring occasionally. Remove from heat. Stir the chopped fresh tomato and lime juice into the beef mixture. Put the toppings in a bowl and place it in the middle of a platter. Top with guacamole, cilantro, and green onions. Add the chips to the platter. Dip the chips and enjoy.